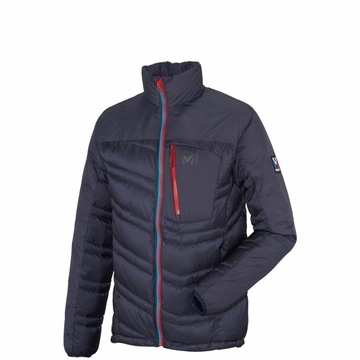 This lightweight, insulated jacket is built for technical mountaineering activities and is ideal to wear as a layering piece or a stand-alone piece. Made of a down blend combining down and Microloft, it is highly compressible and stores easily in a backpack. Millet’s own Microloft keeps you warm when it matters most. Microloft, explains Alex, product manager, “delivers a good performance in action with its temperature regulation properties.” The Saphir colour will be your most versatile option, for a trendy lifestyle look. Trilogy, for Millet, is the ground of modern mountaineering when you take the essential and carry the lightest weight on your ascent, trace new routes, climbing quickly and steadily. It is the lightweight “revolution”. The Trilogy collection gets its name from the mountaineering history. In the 80s, Éric Escoffier and Christophe Profit, mountaineers from the Millet team, set a challenge: A solo peak bagging winter ramble of the three North faces (Cervin, Eiger, Jorasses).